Two major Canadian milestones are coming up for neighbours, Nunavut and Newfoundland and Labrador! On March 31st, 2018, Newfoundland and Labrador celebrates 69 years of Confederation, and on April 1st, 2018, Nunavut celebrates 19 years as the third territory of Canada. Newfoundland and Labrador – Happy 69th Birthday! Though often shortened to Newfoundland, in 2001 its name was officially changed to “Newfoundland and Labrador.” The newer name reflects the large area of land on the continental mainland. 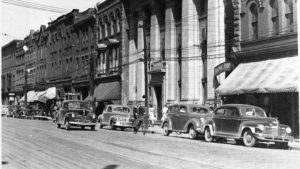 It was March 31, 1949, when Newfoundland joined Confederation, making it the youngest Canadian province. From 1907 – 1949 it was a British dominion, as were Canada, New Zealand, and Australia. 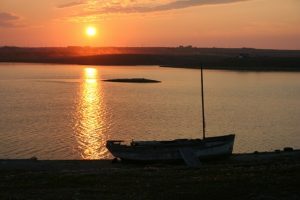 Newfoundland and Labrador has a 30-minute time zone, which is quite unusual. Newfoundland and Labrador is 90 minutes ahead of Eastern Time, and 30 minutes ahead of Atlantic Time. St. John’s, the provincial capital, is one of the oldest settlements in North America. There are several possible origins for its name, including being named after explorer John Cabot, who may have sailed into its harbour in 1497. Water St. in downtown St. John’s is reputed to be North America’s oldest street. Row houses are painted in bright and vibrant colours so that ships coming into St. John’s harbour can see land more easily. This makes even more sense since fog is a common occurrence, averaging 200+ days per year. Nunavut – Happy 19th Birthday! Nunavut is an Inuit word which means “our land.” On April 1, 1999, the eastern part of the Northwest Territories became Nunavut, dividing the massive territory. This change was decades in the making, and involved the largest land claims settlement in Canadian history. The Inuit gained control over 350,000 square kilometres of land, including mineral rights to a portion of the land. The creation of Nunavut brought about the first change to our nation’s map since Newfoundland and Labrador joined Confederation on March 31, 1949. The sun rises and sets differently in Nunavut than what most Canadians experience. This territory’s earliest sunset happens in mid-December, at 1:40 p.m. The latest sunrise takes place closer to Christmas at 9:25 a.m. During the summer months, the capital, Iqaluit has more than 20 hours of sunlight every day! Hard to imagine for most! “Country Food” in a term used to describe traditional Inuit foods. 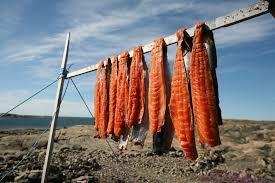 These include caribou, whale, arctic char and seal meat. Since the earliest days, country foods were consumed for day-to-day survival. Today, these foods create family and cultural connections, and are a huge part of the Inuit values of sharing and caring for one another. Adopted on April 1, 1999, the blue and yellow colours symbolize the richness of the land, sea and sky. The red reflects Canada, and the Inuksuk at the centre represents stone structures in human likeness. Inuksuks guide people on the land, and are also used to mark special or sacred locations. The star is the North Star or “Niqirtsuituq”, which is symbolizes the leadership of elders in the community. The Flag Shop is here to help you celebrate all that’s great about your province or territory, (including Newfoundland and Labrador, and Nunavut, of course!) with flags of all sizes, as well as friendship pins, crests, window clings, and decals! See the vibrant array, including provincial sets! For interesting stories and information about flags, and to stay on top of community events happening across Canada, bookmark our blog. Remember to subscribe in the upper right of the blog page, so you don’t miss a thing! And, don’t worry, if you’re not hanging off every word, unsubscribing is easy! OPA! The official name of Greece is the Hellenic Republic. 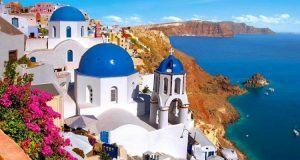 This breathtaking country has thousands of islands, including places such as Mykonos and Santorini. As one of the most mountainous countries in Europe, it is home to the well-known Mount Olympus, which has more than 50 peaks. The highest of these peaks is an impressive 9570’. You get the idea – it’s majestic! Today, Greece is an independent republic, full of indescribable natural beauty and cultural pride – but it wasn’t always that way. March 25th is a dual national holiday in Greece, important for both historical and religious reasons. It is known as Greek Independence Day, and also Annunciation Day. What is Greek Independence Day? Greek Independence Day marks the start of the War of Greek Independence. 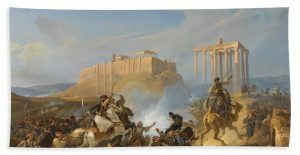 The war began nearly 200 years ago, on March 25th 1821, freeing Greece from Ottoman rule. The Ottoman Empire is also known as the Turkish Empire (or what would become modern-day Turkey). This fight for freedom brought an end to 400 long years of oppression, as well as the return of the land now known as modern-day Greece. Annunciation Day is a day when the Greek Orthodox Church observes the “Celebration of the Annunciation.” Annunciation means announcement, and more specifically in Christianity, it is the announcement by the Archangel Gabriel to the Virgin Mary that she was to give birth to the son of God. Interestingly, for Greeks given the names Evangelos, Evangelina, – and names originating from these – such as Evan, Eva, Vangelis, Angelo, Angela, or even Angie, it’s particularly special, because in Greek, “Evangelisimos” means annunciation. So, for all the Angelas out there, Happy Angie Day! In Greece, it is a public holiday, and many go to church in the morning to celebrate the Annunciation, and then go to a memorial service to mark Greek Independence. On this day, parades featuring Greek flags, people dressed in traditional clothing, and marching bands, take place all over Greece. Freedom and Annunciation come together on this day, acknowledging that during the time of Ottoman rule, it was the Greek Orthodox Church that helped Greeks in captivity to guard their faith, traditions, language, and culture. Theodoros Kolokotronis and Giorgos Karaiskakis are revolutionary heroes in Greek history who led the fight for Greece’s freedom in 1821. The distinct costume of white leggings and pleated skirts with pompom shoes was the traditional military uniform worn by elite soldiers during the battle against the Turks. The skirt has a whopping 400 pleats, each representing one year of suffering. The uniform is called an “Evzonoi.” Today, the Evzonoi is worn for traditional dance performances. On this day, Greeks everywhere enjoy crispy, fried cod with a garlic sauce called “bakaliaros skordalia.” While March 25th is during Lent, and fish would not normally be served, the Orthodox Church makes an exception for Annunciation. The stripes on the flag of blue and white are said to represent the battle cry, “Ελευθερία ή Θάνατος!”, which means “Freedom or Death!” At The Flag Shop, we get excited about flag design history and details, and we also know the blue stripes symbolize freedom and the white, death. The Greek national anthem, called “Hymn to Freedom” was originally a famous poem written by Dionysios Solomos. The poem contains a total of 158 verses! Only the first 24 verses are used in the Greek national anthem. Where to Get Your Greek Flags? We thought you’d never ask! All of our Flag Shop locations across Canada carry Greek flags in all sizes! We also have lapel pins, vinyl decals, car flags, pennant strings, paper flags, and crests. We are here to help you celebrate all things Greek! Be sure to let us know if you need a specific item, because you might be surprised to see what we can dig up in our warehouse. Happy Greek Independence and Annunciation Day! If you enjoyed this blog, and would like to read more interesting stories about flags, and events taking place in your community, subscribe to our blog in the upper right corner of the page at: blog.flagshop.com. It’s quick and hassle-free! And, don’t worry, if you’re not hanging off every word, unsubscribing is just as easy! March 20th is a pretty big day – not only is it the first day of spring, it’s also International Day of Happiness! What does this mean for Canadians and nations around the world? Also know as Happiness Day, this day is set aside for celebrating, and focusing on things that make you, and others around you, happy! Happiness: Why Does It Matter? Happiness matters to everyone. We all want to live fulfilling lives, and we want the same for our families and friends. Happiness is about our overall satisfaction with all parts of our lives. It is influenced by many things, including our external circumstances, our attitudes, the choices we make, and our sense of purpose. 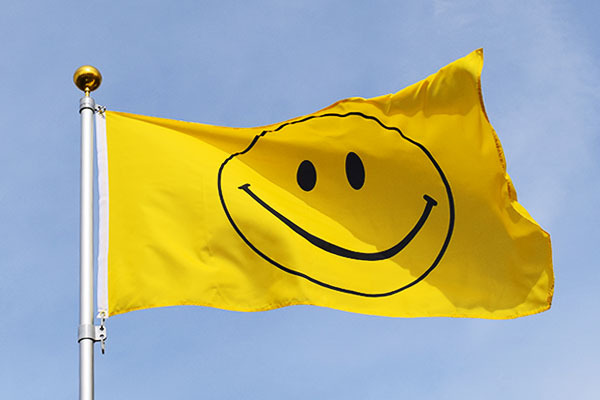 We’re a pretty happy bunch here at The Flag Shop, and we know it can only be more of a good thing to focus on happiness on March 20, and to be a part of a world movement. Happiness is different things to different people, so what’s it to you? The United Nations (UN) is the world’s largest intergovernmental organization, made up of 193 member states, each having equal representation in the UN General Assembly. Canada has been a member of the UN since November 9, 1945, and joins hands with all member countries in the universal pursuit of happiness. The first UN Conference on Happiness was held in April of 2012. It was at the conference that the UN announced International Day of Happiness would be observed every year on March 20, with the first one in 2013. 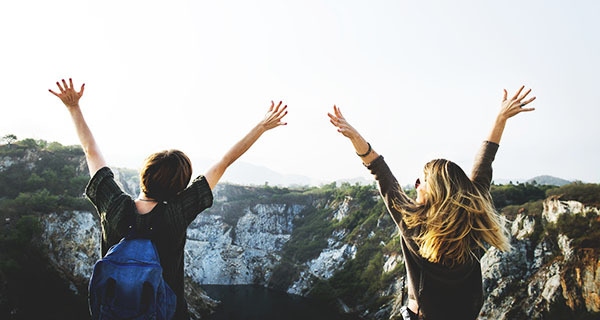 Take action for a happier world, join the Happiness Movement and get your hands on some cool stuff, including: A World Happiness Report and a World Happiness Guidebook. We hope you’ll agree that pursuing happiness is a great thing, and we’re here to help you get ready for the big day! Contact us at any of our locations across Canada for products including pride Happy Face buttons and Happy Face tattoos, and United Nations flags. Of course, for a different kind of happiness, you might want to look at cocktail flags, or even flags of your favourite sports team. Let us know if you’re looking for a particular item, because you never can tell what we’ll find in our warehouse! Have a Happy Happiness Day! St. Patrick’s Day is almost here! 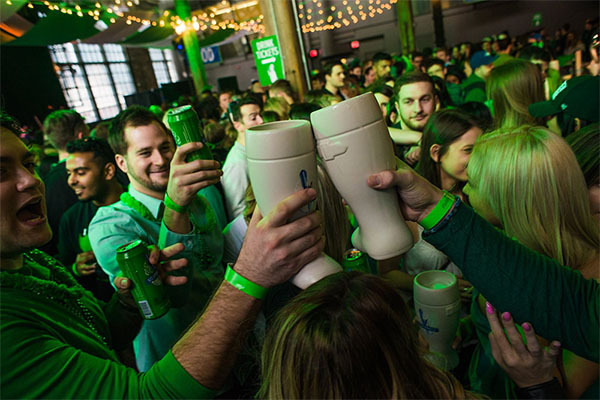 On March 17, people everywhere, – Irish, or not – will celebrate with green drinks, Irish jigging, and parades! What is St. Patrick’s Day and why is it important? Also known as St. Paddy’s Day, this day is important because it marks the anniversary of the death of a Christian missionary named Patrick. He was born in 387, and died on March 17, 461. The day is celebrated in Ireland, and by all of the more than 70 million people of Irish descent around the world. In Ireland, St. Patrick’s Day is a public holiday and, for our friends in Newfoundland and Labrador, it is also an official holiday. 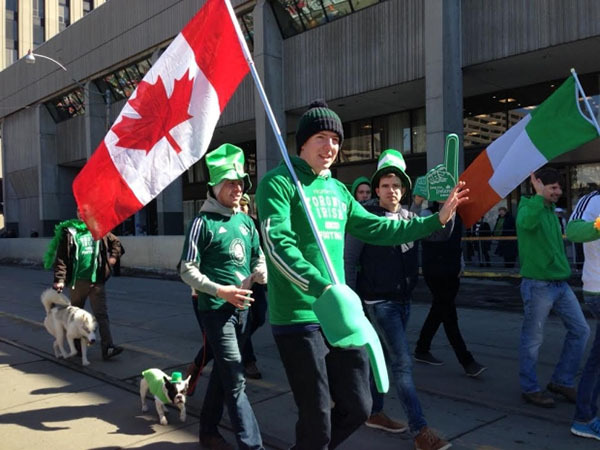 In 1824, Irish Immigrants founded a St. Patrick’s Day parade in Montreal; today, it’s the longest-running parade in North America. If you’re celebrating the day, you better wear green! Green is one of the colours in Ireland’s tri-colour flag, which was first publicly flown in 1848 in the city of Waterford, by an Irish-American patriot named Thomas Francis Meagher. Ireland is known as the “Emerald Isle,” and green is symbolic of Ireland’s lush green landscapes. 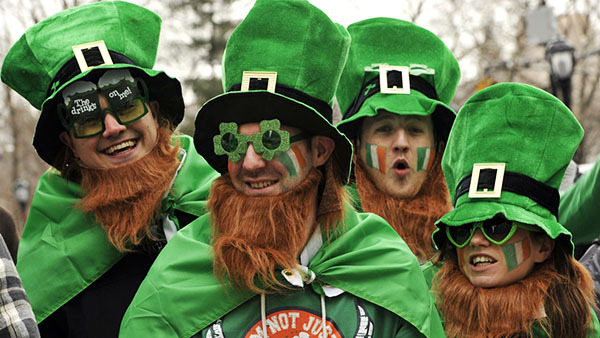 Wearing green on St. Patrick’s Day is a modern-day tradition, for those who wish to be invisible to leprechauns (to avoid being pinched by them). Some humans pinch others, too (for not wearing green), but only as friendly reminders to stay away from “pinch-happy” leprechauns! 1. It’s a Guinness Day! During St. Patrick’s Day, the amount of Guinness consumed around the world reaches almost triple the usual amount! On a regular day, 5 million pints are poured, which jumps to 13 million pints, on March 17. Quick math tells us that’s an astonishing 150 pints per second! 2. There are No Girl Leprechauns! If you’ve ever seen St. Paddy’s Day decorations showing female leprechauns, don’t get sucked in to the lies! According to Irish folklore, there is no such thing as girl leprechauns! Who knew? 3. Who is Maewyn the Brit? St. Patrick was actually born in Britain and given the name Maewyn Succat. Don’t worry, we’re surprised, too! According to history, he was sold into slavery in Ireland as a teen. He escaped, returning to England. There, he became an ordained priest named Patrick. Why do we think of shamrocks on St. Patrick’s Day? Hint: It’s not about minty, green milkshakes! It is said that St. Patrick used the three leaves to symbolize the Holy Trinity when he introduced Christianity to the people of Ireland. 5. St. Patrick Himself Would Have Gotten Pinched! St. Patrick would have been pinched plenty of times on his own feast day, because his preferred colour was blue. In fact, green only came to be commonly accepted as the colour of St. Patrick in the late 18th century, after it was associated with the Irish independence movement. Find a Celebration Near You! There are so many events going on across Canada, and we found a few to share. So don’t be a big eejit! Follow the links, get out there, have a green drink and learn an Irish jig! 10 p.m. to 3:00 a.m. Enjoy live music by The Shenanigans and DJ Zeus. Don’t miss the balloon drop at midnight! This 30th Annual St. Patrick’s Day Parade is sure to be a blast, hosted by the St. Patrick’s Parade Society. Calgary’s Original St. Patrick’s Day Road Race supports The Canadian Diabetes Association and The Calgary Road Runners. Be a part of the 195th St. Patrick’s Day parade, the oldest St, Paddy’s Day Parade in North America. Join the fun as Quebeckers and Irish celebrate their strong ties, dating back to the early 19th century when hundreds of thousands of Irish immigrants first came to Québec. 2:30 p.m. and 4:00 p.m.
Join in on the festivities and live entertainment, including the gloriously green 7th Annual St. Patrick’s Day Parade! Where to Get Your Irish Flags? We’re so glad you asked! 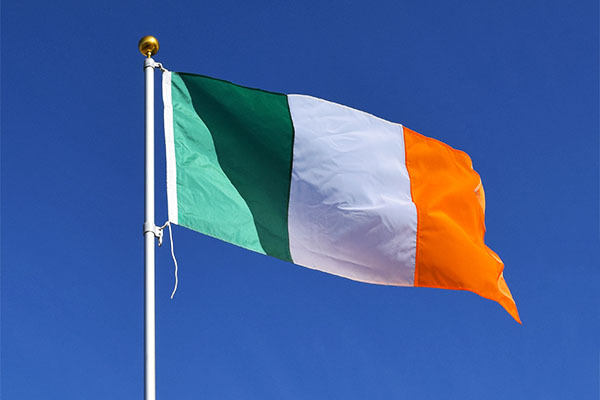 All of our Flag Shop locations across Canada carry Ireland flags, in all sizes! We also have crests, lapel pins, and decals. We are here to help you celebrate all things Irish! Be sure to tell us if you need a specific item, because you might be surprised to see what we can dig up in our warehouse. It’s that time of year when we observe International Women’s Day (IWD), and we are thrilled to join Canadians and nations around the world in celebrating women and their contributions towards making the world a better place. Canada’s theme for International Women’s Day 2018 is “#MyFeminism”, recognizing feminism as an important and powerful global movement which has resulted in the advancement of women. #MyFeminism is inspired by the people who have contributed to shaping Canada into a nation of freedom and equality. From the Canadian women of the 1800s who fought for the right to vote (known as the suffragists) to the advocates and activists of today who continue to work towards positive change, International Women’s Day honours these women. 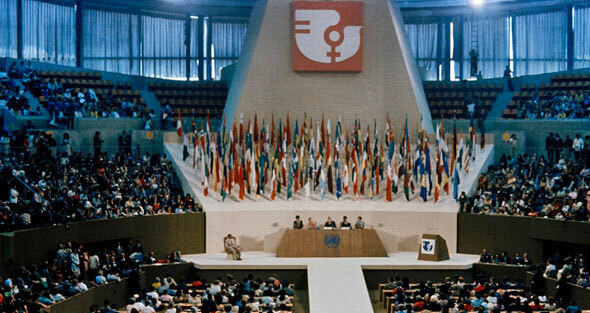 It was in 1975 that the United Nations recognized International Women’s Year. The UN later adopted a resolution designating March 8th as International Women’s Day. 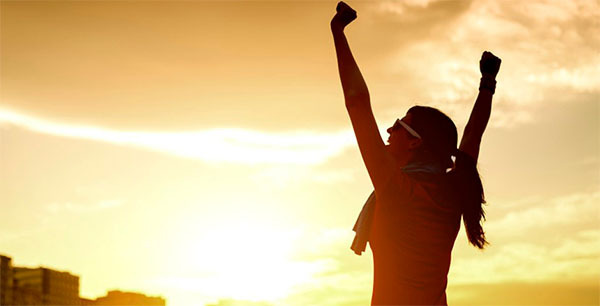 Today, International Women’s Day is observed around the globe, and in many countries is a national holiday. As a global day of recognition of women’s achievements and contributions, this day supports an important call to action: advancing women’s rights and gender equality. The Flag Shop has a strong heritage of leadership by women, which began in 1975 – fittingly in the same year as International Women’s Year. That was when Doreen Braverman founded the first-ever, full-service flag store in the world. Then, in 2010, Susan Braverman stepped in, purchasing the company and becoming President. Over the years, our business has brought countless opportunities, for women to grow and thrive in many ways, including social advancement, economic livelihood, innovation and creativity. We love International Women’s because it reminds us where we come from, and provides opportunities to honour the invaluable contributions of our woman business owners of the franchise team: Le Flag Shop Montreal Owner-Manager, Ginette Bazergul; The Flag Shop Toronto Partners, Lilly and Ladan Siahpoosh; The Flag Shop Nova Scotia Owner, Debbie Hartlen; The Flag Shop Edmonton Owner, Phyllis Bright; and The Flag Shop Saskatoon Owner, Judy Denham. 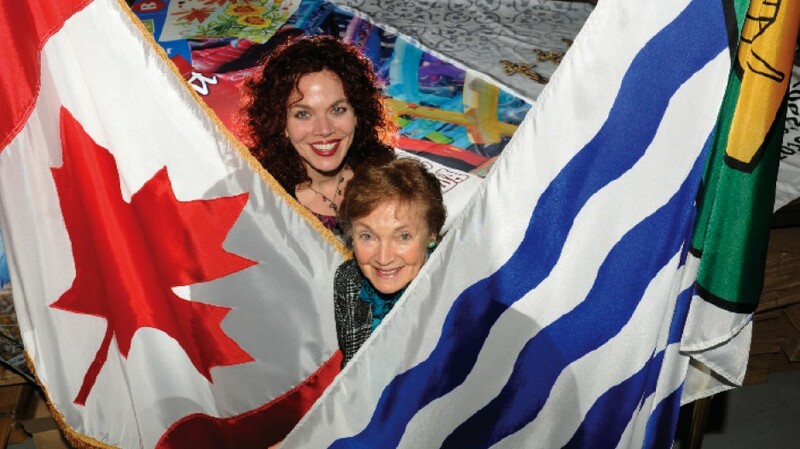 Of course, we can’t forget the women of the franchise management team and The Flag Shop Vancouver Head Office, who bring value to the table every day, contributing to The Flag Shop’s lasting legacy. Join us as we celebrate International Women’s Day, to honour and advocate women, and to help create a brighter future for the daughters of all nations! On March 8th, add your own voice to all those who are calling out inequality, by using the hashtag #MyFeminism. This event challenges people from all walks of life to take 10,000 steps (7K walk), which represents the distance many women and girls in developing countries travel every day to reach the basic necessities of life, such as water. Thursday, March 8, 2018 – As a thriving women-owned business, Bandidas Taqueria, a restaurant on Vancouver’s Commercial Drive, will donate 100% of its profits to local organizations which serve women. It will also launch an art show highlighting feminist themes, which will run until April 21st, 2018. Thursday, March 8, 2018 – This lunch event will include inspiring keynote speakers Tracy Porteous, Executive Director of Ending Violence BC, and JR LaRose, of CFL and BC Lions fame, and the “Be More Than a Bystander” spokesman, to address the cause of ending violence against women. Thursday, March 8, 2018 – Calling all change makers to unite and celebrate women who are making their mark, as they tell their stories, and speak their truths in the name of equality, justice and peace. Thursday, March 8, 2018 – Event highlights include a spectacular fashion show by “Making Changes”, a community of women helping women and teenage girls through life’s transitions, by providing them with skills and resources to support their pursuit of meaningful work. Enjoy musical performances by local artists. Thursday, March 8, 2018 – Attend an all-ages screening of the movie “The Breadwinner”, about an 11-year old girl, named Parvana, living under Taliban rule in Afghanistan. Following the unjust arrest of her father, she cuts off her hair and dresses in boy’s clothing to help support her family. Parvana discovers a whole new world of freedom and danger. Thursday, March 8, 2018 – Watch this epic film, a 2016 Yorkton Film Festival winner, about a former child bride named Selvi. Escaping a violent marriage, she becomes South India’s first female taxi driver. In this years-long journey, Selvi defies expectations and creates a new life of hope. Thursday, March 8, 2018 – Join the Women’s Resource Centre for cake and share messages with woman around the globe on their message board, and share your stories of inspirational women, to be displayed at the centre. Sunday, March 4, 2018 – International Women’s Day is about unity, reflection, advocacy and action. This group continues to grow from strength to strength. Join the celebration including exhibitors, speakers and door prizes. Thursday, March 8, 2018 – Bowling, anyone? Join an event organized by Bangladeshi-Canadian women, who envision a world in which all girls and women, regardless of age, race, ethnicity, income level, or social status, are nurtured and empowered to reach their fullest potential. You are currently browsing the The Flag Shop Blog blog archives for March, 2018.